It may be August, but it’s the start of a new year at William & Mary. While new students, faculty and staff familiarize themselves with the university, those returning to campus may notice some new aspects of W&M, from the material to the academic. The College (COLL) Curriculum enters its fourth year with the implementation of COLL 400 courses, where students will draw from the knowledge they’ve gained from studies in their major and other courses and experiences to form their own scholarly work. Students are expected to synthesize and apply critical analysis, solve problems in an applied and/or academic setting, create original material or original scholarship and communicate effectively with diverse audiences. They can accomplish COLL 400 through upper-level seminars, independent study and research and honors projects that are specially designated by departments, programs or schools. This year’s COLL 300 themes are “Bodies that matter” for the fall semester and “Ceremony” for the spring 2019 semester. More information may be found on the Center for Liberal Arts website. 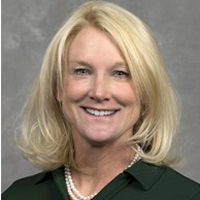 Julie Cunningham Shackford ’88 was named the third women’s soccer coach in school history on Dec. 13, 2017. The team began play under her leadership in August, winning its first two exhibition games. A 25-year coaching veteran and former national coach of the year, Shackford owns a 245-130-33 record (.641) as a head coach with stops at Princeton and Carnegie Mellon. She was the head women’s soccer coach at Princeton from 1995 to 2014, and is the university’s all-time wins leader (203) and guided the Tigers to an NCAA College Cup semifinal, six Ivy League titles and eight berths in the NCAA tournament. Tim Doyle was named head volleyball coach on Jan. 22, 2018. Doyle will lead the team in its first regular season game Aug. 24. as part of the Woldcat Classic. He spent the last four years helping transform Virginia Commonwealth University into a top-tier program. He was selected to the 2017 American Volleyball Coaches Association Thirty Under 30 list. In 2017, the Rams reached 30 wins (30-3), fashioned the longest win streak in the nation (27 consecutive matches), collected their first Atlantic 10 regular season and tournament titles and advanced to the NCAA Tournament for the first time since 2005. Forest Braden takes over as coach of the women’s cross-country team, which competes for the first time this season Sept. 1 as part of the Richmond Spider Alumni Open Women’s 2M. He came to W&M after a successful eight-year run at UCLA. The Bruins reached the NCAA Cross Country championships six times, with the men finishing in the top-20 four times in the last five years, and the women finishing 27th in 2014 and 28th in 2016. The 2012 men's team, his first to make NCAAs, finished 13th overall for UCLA's best finish since 1985. On June 12, 2018, the iconic creature that roams arenas, sidelines and athletics events was named "Reveley," in honor of the university's 27th president, Taylor Reveley. Back by popular demand, students may price-match their textbooks at the W&M Bookstore. Full information is available on bookstore.wm.edu. In the fall of 1918, 24 women were admitted as undergraduate students at William & Mary, making W&M the first public coeducational university in Virginia. Today, women represent 58 percent of W&M’s students and also include professors, deans, coaches, award-winning scientists, playwrights, poets, entrepreneurs, community leaders and more. During 2018-19, the university will celebrate the accomplishments of the 55,000-plus alumnae, and the university’s women students, faculty and staff of W&M. 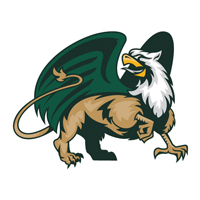 More information may be found on the W&M Women website. Last year, more than 1,600 students participated in two comprehensive surveys. After extensive analysis of the results, and in consultation with the Student Culinary Council, the Block 175 dining plan was introduced as a Block option available to freshmen and sophomores, replacing the weekly Gold 14. In addition, the Freedom, Gold 19 and Block 175 plans are all priced consistently but provide greater flexibility for individualized dining habits. The Freedom plan is designed for students who like the variety of options in the dining halls, the Gold 19 plan supports students who eat complete meals at more consistent intervals but also balance those meals with access to Dining Dollars, and the Block 175 plan was designed to offer students greater flexibility in how they use their meals throughout the semester and to provide an option that averaged less than 14 meals per week. If budgeted weekly, the Block 175 was designed to offer 11 meals per week. Additionally, students may purchase guest meals at Commons Dining Hall and Sadler Center using their Dining Dollars for $7.25. Students will see their full meal swipe balance in one account and can purchase as many guest meals as their Dining Dollar balance will allow. At Commons, a Mediterranean-themed station has been added, serving halal-certified meals and authentic Mediterranean cuisine, Monday through Friday for lunch and dinner. Mosaic Bowls will now be available seven days a week. From Monday through Friday, lunch will be served until 2:30 p.m., dinner until 8 p.m. On Saturday and Sunday, it will be open from 11 a.m. to 8 p.m. Made-to-order omelets will be available for lunch on both days. At Sadler, the Mongolian Grill is returning, preparing fresh made-to-order stir fry. Maize will be relocated next to the Mongolian Grill and, based on strong customer feedback, the salad bar will return to its previous location closer to the entrance. Maize will also be expanded to include additional options utilizing the space previously occupied by the salad bar. Based on survey results, Sadler’s weekend hours have been adjusted to provide more lunch options yet retain the made-to-order omelets for breakfast and lunch on Saturday and Sunday. Sadler will serve lunch until 2:30 p.m., dinner until 9 p.m. and be open 8 a.m. to 9 p.m. on Saturday and 8 a.m. to midnight on Sunday. Sadler will be open for late-night eating, Sunday to Thursday, 9 p.m. to midnight. The Marketplace will begin serving a rotating menu of vegan-friendly options, including a rotating menu of compound salads. For breakfast, a separate omelet bar has been added to increase efficiency, and the waffle bar has been upgraded. In retail news, the seafood menu will return to the Tribe Truck beginning the first day of class. Cosi has reorganized its ordering and payment process to provide better efficiency and service. Chick-fil-A is scheduled to open toward the end of September after it conducts extensive two-week hands-on training. The Law School Café is offering a completely new menu. In other news, dining.wm.edu received a completely new look over the summer and is now mobile-friendly. The website can be used to view menus, current hours of operation and special events. Student can also reload their Dining Dollars in increments of $10, and each purchase includes a bonus of 10 percent in additional Dining Dollars. W&M Dining also recently hired a new campus dietitian, Stephanie May. May is AllerTrain certified and is experienced in nutritional assessments, menu development and analysis and sports-specific nutrition therapy. For more information about the special diets program with William & Mary Dining or to schedule a consultation, email [[specialdiets]]. Many snack and beverage machines now accept credit card and mobile pay in addition to W&M Express and cash. 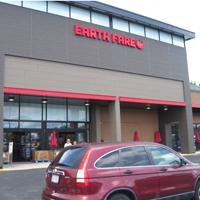 Two new merchants were added over the summer: Earth Fare and Fresh Market. Students may deposit funds using getfunds.wm.edu and faculty/staff may add funds to their Express account through payroll deduction. The McLeod Tyler Wellness Center, located behind the Sadler Center, is complete and in the process of opening for business. This new facility contains the university’s health promotion team, counseling center, health center, campus recreation’s wellness programming and a Center for Mindfulness and Authentic Excellence. 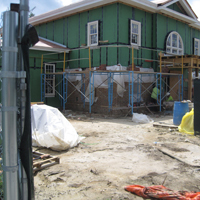 Work continues on Landrum Hall. The residence hall, located off of Jamestown Road, is undergoing a major renovation with all-new finishes, fixtures, and building systems and creation of a two-story atrium space and entry on the north side. The renovation is expected to be completed in October. The Shenkman Jewish Center marks a new beginning for Jewish students to explore and strengthen their identity on campus as well as feel more connected with each other and the university. Mark and Rosalind Shenkman, the generous benefactors behind the 3,000-square-foot center, envision it as a central gathering place for Jewish students to participate in a variety of cultural, spiritual, social and educational activities and programming. It is scheduled to open this fall. The Adair Hall elevator is expected to be completed in late September to greatly improve accessibility to and within the building, and the accessible restrooms portion of the project is complete. Ground was broken on June 13 for construction of the Reveley Garden, to be located between Jefferson and Ewell/Washington Halls. The garden is being built in partnership with the Garden Club of Virginia to honor Taylor and Helen Reveley’s service to William & Mary. Improvements to the Crim Dell, the Health Center pond and the Wildflower pond are complete, making the university’s storm water management system more robust and attractive. The brick pathway system continues to improve with construction of a new route around the west end of the Sunken Garden and repairs to the pathways near the Wren Building and Tucker Hall. Associate Vice President for Facilities Management Van Dobson said that while these improvements look great, they more importantly improve handicap access around campus. All should be complete by the end of August. The Wren Building received a fresh coat of paint this summer, helping to preserve it. 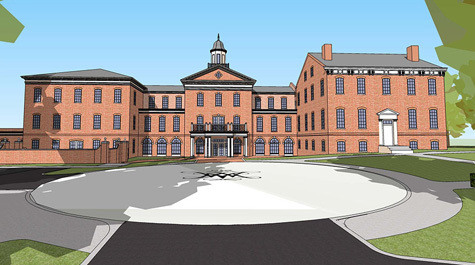 A major addition to the Alumni House is expected to commence this fall with completion planned for late fall of 2019. Groundbreaking for the Busch Field team building should occur this fall with completion planned for summer 2019. The West Utility Plant, being built just north of Adair Hall, will continue, with completion planned for fall of 2019. Work on Phi Beta Kappa Hall and construction of the new music building just east of Phi Beta Kappa Hall will also break ground this fall, with completion expected in 2021. The Muscarelle Museum of Art at William & Mary has moved temporarily into what was previously the Williamsburg Art Gallery in Merchants Square. The interim space will be known as “Muscarelle on the Move” while the museum expands as part of The Martha Wren Briggs Center for the Visual Arts and new Muscarelle Museum of Art. They are expected to open in 2021. Everyone on campus is urged to wear green and gold on Aug. 31 to celebrate #CollegeColorsDay, a national day of spirit. Students may now make court reservations up to 48 hours in advance at no additional charge. W&M Sustainability will launch an Eco-Representative program this fall, composed of knowledgeable student volunteers acting as sustainability ambassadors. Eco-Reps will receive regular training on university sustainability practices and provide support to campus initiatives. The pilot project for this group is new student move-in, where 25 Eco-Reps will be directing families towards recycling stations and breaking down boxes to maximize space within recycling containers. The Office of First Year Experience identified recycling, particularly of cardboard boxes from new student purchases, as a challenge during move-in. They observed some new students struggling to find recycling containers on an unfamiliar campus and recycling bins quickly overflowing with intact boxes. This pilot project is complementary to DormMania, a student-run initiative in which dorm items are collected during move-out, diverting useful items from a landfill destination, and selling them at yard-sale prices to students during move-in, Aug. 24 to 26. Eco-Reps will be wearing lime green, helping new Tribe members make their first steps on campus a little more sustainable. The Green Line and the Trolley routes were adjusted through Williamsburg Area Transit Authority to allow for shorter wait times and better movement through campus. Beginning Aug. 27, the Green Line will begin at Brooks Street at 7 a.m. (10 a.m. Saturday and Sunday) and travel toward the Commons and the W&M parking garage on Ukrop Way. The bus will then travel to Ludwell Apartments, Cary Street, W&M Law School and Zable Stadium, completing a 30-minute loop. The final stop for the day will be at 10 p.m. The Trolley will begin at New Town’s Legacy Hall at 9 a.m. and travel toward campus via Richmond Road, stopping at Richmond Hall, Blow Hall and Tribe Square, completing a 20-minute inbound route. Outbound, the Trolley will travel along Richmond Road to Monticello Avenue, Treyburn Drive and Ironbound Road, completing a 30-minute loop. The final stop of the day will be at 9 p.m. Monday through Thursday, 11 p.m. on Friday and Saturday and 6 p.m. on Sunday.